The azalea is a member of the heath family, in the genus Rhododendron, and a relative of the blueberry. It is a flowering shrub that is popular in the home landscape for its ability to tolerate shade and to bloom in shades of red, pink, purple and white. There are early, mid-season and late blooming azaleas. 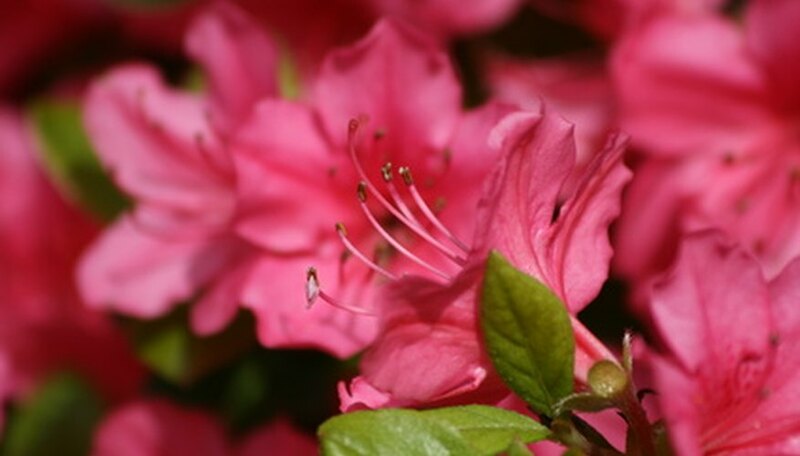 With careful planning, you can have an azalea garden in bloom for at least eight months of the year, according to Master Gardeners at the University of Georgia extension. Plant the azalea in an area that will keep it out of direct sun and protected from winds. The azalea is hardy to various USDA zones, depending upon the variety. Obtain a soil pH test. Although you can purchase a home testing kit at most gardening centers, your county cooperative extension office provides testing and the agent can give you recommendations on materials needed to raise or lower your soil pH. Azalea requires a soil pH of 5.5. Prepare the planting area by adding a three-inch layer of compost or well-rotted manure to the soil and mixing it to a depth of eight inches. Add soil amendments to adjust the pH as needed. Mix them into the soil to the same depth. Dig a hole that is the same depth as the pot that the azalea is growing in. Make it three times the width. Remove the azalea from the pot. If the roots are tangled, gently loosen them with your fingers. Place the root ball in the bottom of the planting hole, fill the hole with soil and use your feet to pack the soil around the base of the plant. Pour a three-inch layer of mulch on the soil at the base of the azalea. Keeping it two inches from the plant, spread it out to the same width as the azalea, completely encircling the plant. Water until you see the water puddle. Keep the soil moist until the plant is established, which will be evidenced by new growth. After that, water when the top two inches of soil are dry. Replace the mulch around the azalea every spring with a fresh layer. Pine needle mulch is preferable as it will help to maintain the soil’s acidity. Prune the azalea in early spring. Growers with the Azalea Society of America suggest that you prune in stages to minimize the shock to the plant. Cut out all dead wood and then remove two or three tall branches. Cut them back to a branch that is growing in the direction in which you want the plant to grow. The following year remove three more branches and repeat the procedure in the third year. Experts at the Azalea Society of America say that the azalea does not require fertilizer as long as the plant has mulch.